I attended the School Section session this year because I’m interested in learning more about this area. Amanda Chamberlain, CTRS/ L was the presenter for this session. She discussed several aspects. I’ve decided I’m going to take initiative and help with this area because it is something I feel passionate about. I’ve set a personal committment to do research and submit an article for the ATRA newsletter. There are recreational therapists working in school systems in several other states. Recreational therapy in a school setting wouldn’t be for all children. It would be for children who need it. Special education and speech therapy are examples of services provided in schools for those kids who need the services. Interpersonal (social) skill needs. An example might be a child with Autism who lacks friends. Physical health limitations and needs. An example might be a child with impaired mobility or movement. Intellectual disability or other learning needs. An example might be a child with a learning disability, like dyslexia, or a child with lower IQ. Children in public schools with special needs have an Individualized Education Plan (IEP). 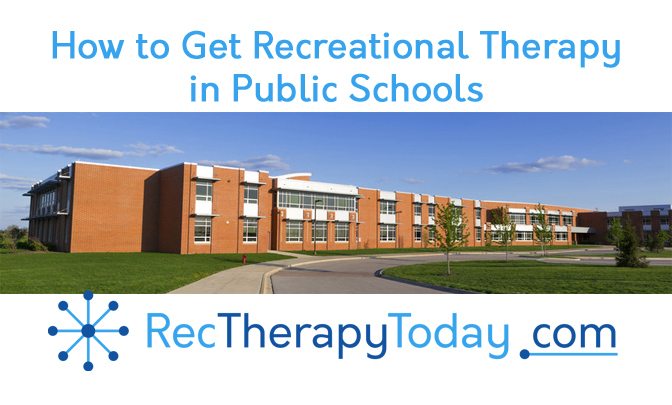 Recreational therapy is on IEPs for some school districts in America. Recreational therapists provide interventions to assist children with maintaining and improving several domains. There is so much that can be done in the schools. Advocacy is the best thing that can take place at this time. The best advocate for services is parents on a mission to help their child. A parent wants the best services for their child and they are willing to go to the top and ask for it. Los Angeles Unified has 16 Full Time Recreation Therapists. We have about 500 students receiving RT services as part of their IEP’s. Currently, another 75 are being assessed.